It was a struggle to write this review for two reasons. First, it’s a genre-breaker, like nothing you’ve probably ever seen before. Second, I had to tear myself away from a very successful play through in order to do so! But in all honesty, if I hadn’t agreed to review this particular gem with an early beta key, I might have been put off from playing past the first 10 minutes. It’s just all so extremely different and confusing! So, just as well, then, that later gameplay is conversely incredibly rewarding. 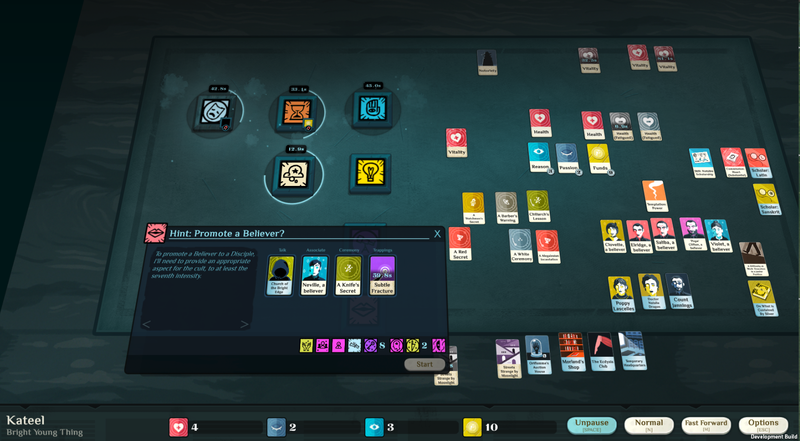 Cultist Simulator is the first product from WEATHER FACTORY, an indie made up of just Alexis Kennedy and Lottie Bevan, two of the creatives who, while at Failbetter, produced Fallen London, Sunless Seas and its follow up, Sunless Skies. After a successful Kickstarter in September last year, it looks like a rare case of not only such a campaign being successful, but also with its promises upheld AND delivered on time! Indeed, they raised nearly 300% over their mark and nailed their campaign target in just 12 hours. 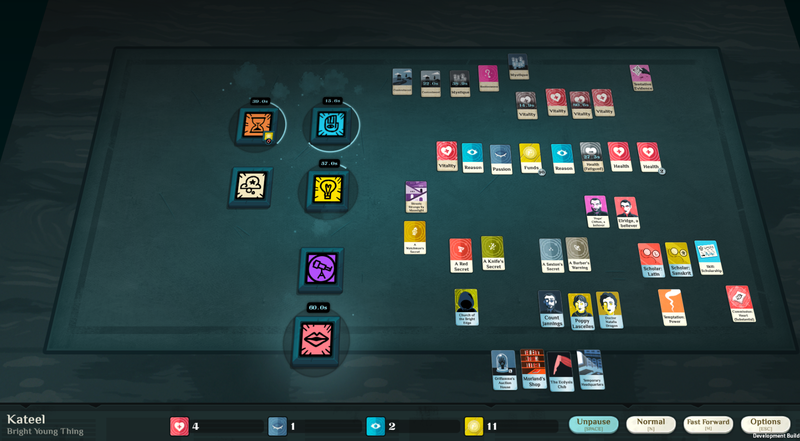 Cultist Simulator is an award-winning game of apocalypse and yearning. Play as a seeker after unholy mysteries, in a 1920s-themed setting of hidden gods and secret histories. Perhaps you’re looking for knowledge, or power, or beauty, or revenge. Perhaps you just want the colours beneath the skin of the world. Or maybe not! To be fair, it’s a difficult game to describe. You start with a single card, which represents your career, and a single “Verb”, which represents work. Drop your career card into your work verb and a short timer will start, along with a description of what’s happening. At the end of the timer, you might be rewarded with new verb, new cards (representing new capabilities, acquaintances, lore, places, books or more), or possibly new timers which themselves might spawn new verbs or cards. You will pause the game frequently in order to read what’s happening in each of your verbs and what their outcomes are. The actual gameplay itself is set upon a virtual tabletop and you literally drag cards around as if the mouse is your hand. It’s quite engaging once you get the hang of it. You can see a short five minute gameplay video I made, below. So, how do you win? Honestly, I have no idea! 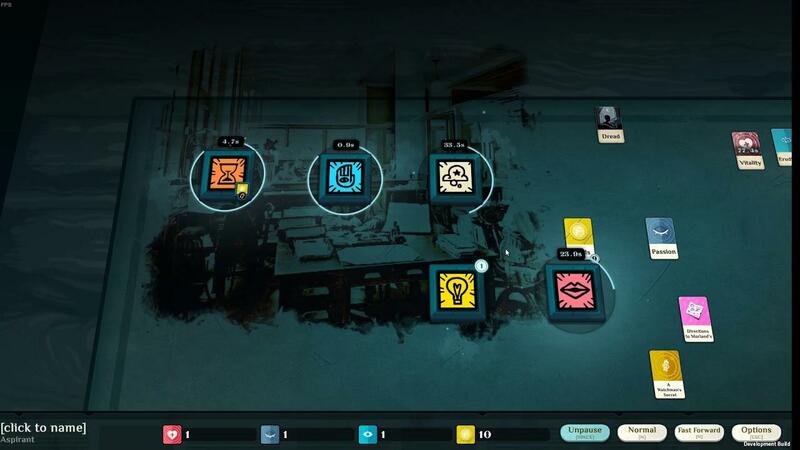 I’ve clocked up nearly 20 hours in Cultist Simulator and I’ve experienced only one ending which I’m not sure can really be considered a victory. 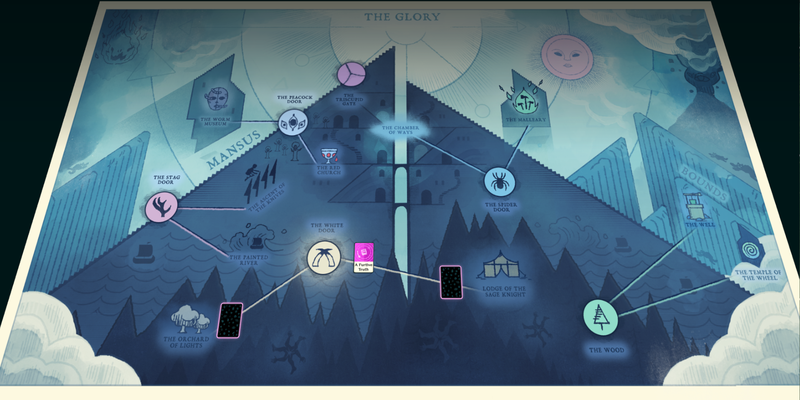 I do know that each game features a set of Dream unlocks which take you to a map of the Mansus, the realm in which Cultist Simulator is set. In this map is a set of Ways which grant further boons, if you can achieve them. So far, I’ve managed to unlock The Wood and The White Door. But this is a game that rewards and indeed encourages experimentation. There’s absolutely no tutorial. The fact that you start with a single card and a single verb is tutorial enough, perhaps, but it’s not all roses. I found the lack of any guide at all initially off-putting. I’m a bit of a perfectionist and I like to know I’m doing things “right” whenever I can. But that’s not an attitude that survives first contact with this game for long. Want to imprison your believers? Sure. Fancy using a blood rite to try to summon a Winter spirit? Why not? Send a bomber to kill a pesky copy? Go right ahead. There are consequences to most actions, lots of variety in outcomes and some roads are easier to travel than others, but there’s definitely no right or wrong here. Just a story waiting to be told. There are other niggles and frustrations along the way. As you’d expect given the creative team, the writing is very poetic, but frankly, some of the card descriptions are frustratingly cryptic. Lore is tied to Aspects, for example, but it’s not clear until much later in the game what each Aspect is actually good for. Clicking each icon for its description is also fairly tedious, as it pops up a dialogue which itself may feature further baffling icons. It’s a game crying out for hover tooltips. This can even be seen in the setting in the options screen which allows you to flip between “worm” and “bird”, but I've yet to figure out what it actually does. I was also hours into the game before I realised that the icons along the bottom of the screen were my health, passion, reason and gold. Yeah, I know. Sometimes I think if I had another brain it would be lonely. In the screenshot above, it took me literally hours of head scratching and multiple subsequent plays to realise that a Believer has to be promoted using the same Aspect that you used to create your Cult. In that example, my cult, the “Church of the Bright Edge” is built on “Knife” Aspect, and I only have two of those present. My eight “Knock” Aspect points are utterly useless. With later familiarity, this becomes more obvious, but in the early game, it will have you climbing the walls. Other niggles include the fact that you can’t use WASD to move the map, zooming always zooms on the centre of the screen, ignoring when you position your mouse, and some of the sound effects are jarringly loud considering what they represent. For example, when a card expires, there’s a small explosion which wakes me up every time it happens… and it happens a lot in this game. Also, when cards expire (with associated explodey noise), they do so instantly, which means that you almost never know what’s actually disappeared… only that something has. 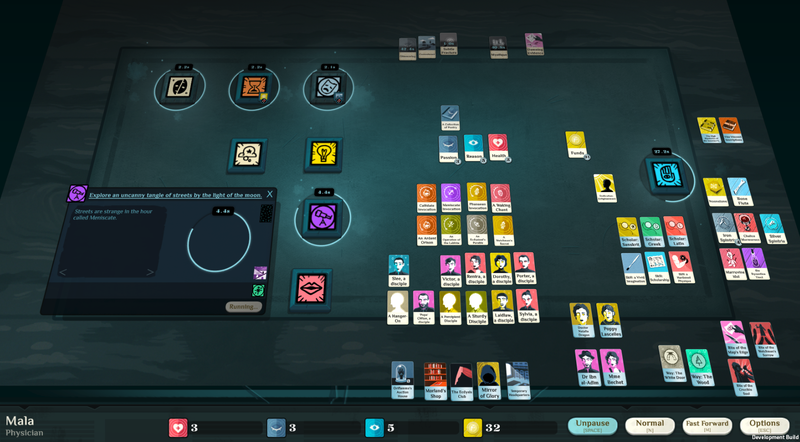 But to sum up, I heartily recommend giving Cultist Simulator your attention. Despite its initially slow start and occasional frustrating niggles, there’s plenty to reel you in: depth aplenty, crisp art, fluid and engaging gameplay, dark and wonderful writing, and it has that “one more go” factor which plays along nicely with the short, snappy game length. And it’s utterly unique. To this stalwart, somewhat jaded gamer, that’s invaluable. It's like a Lovcraftian choose-your-own-adventure thing. I'm intrigued. This looks truly fascinating! =D Kinds sounds a bit like Hand of Fate in some ways... But I'm definitely intrigued. It's already on my wishlist. Watched a game-play video a few days ago, and quite like the premise. Although I'm not that keen on the timer-based approach, it looks like the timer won't be annoying like it is in many Free-2-Play mobile games. Like the clean interface, and the fact that it encourages you to use your imagination as part of the gaming experience. Instabuy on this one, for the Perpeptual edition with all DLC forever (if you buy it during this launch week, you get that), sounds nice. I am sure they will clean up some of the small annoyances mentioned above - it sounds really awesome and interesting. Edit: at Humble Bundle you get the Perpeptual, dunno about the other stores. Interesting game and great review! I played a prototype of this ages ago, was damn good fun. Glad the full version finally landed! Can you summon an angry Tux? lol. Added to my wishlist, probably get it tomorrow as I don't want to start a game shortly before having to go to bed. Yeah, I think I need to get this one. I hope it's not too frustrating though.